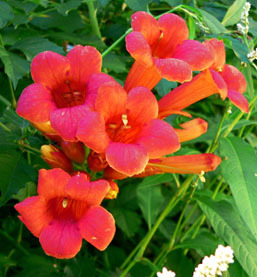 Madame Galen Trumpet Creeper or Campsis radicans is a self clinging trailing plant. A deciduous fast growing trumpet vine, the Madame Galen, is covered with red trumpet shaped flowers during summer. Plant this trailing vine in full sun to partially shaded areas. Water your hummingbird vine regularly the first season planted to establish. Prune annually in late winter. Note: wear protective clothing when pruning as the sap is poisonous and can irritate skin. Thought trumpet vines show no serious disease problems, they are self seeding which produces suckers making them sometimes aggressive growing vines. Trumpet creepers are native plants to the Southeast United States. Madame Galen Trumpet Creeper ships in 3.5 inch pots.